Garden City Groundskeeping is the distributor for SYNLawn in Mississauga, Oakville, Etobicoke, Brampton and surrounding areas. While we wholesale to other companies, we are also the most qualified installation and maintenance experts in the area, providing full service for your synthetic turf lawn and landscape. Are you searching for where to buy artificial grass? Call Garden City Groundskeeping. We have been providing services in southwestern Ontario since 1979. As a landscape industry leader, we are proud to carry the SYNLawn line of artificial turf products. It’s practical, environmentally friendly and saves you time and resources in landscape maintenance. With several varieties of grass, it fits in any landscape. Garden City Groundskeeping is an installer of complete synthetic lawn systems for both large-scale commercial and residential landscapes. We have the training and experience to give you an attractive lawn that will look great (and real) for years to come. Artificial turf installation requires training and experience to ensure the best result. SYNLawn guarantees the quality of their products, with a manufacturer’s warranty of 8-15 years, depending on the product. SYNLawn products come in nylon or polyethylene and are modelled after real grass. The difference in synthetic varieties is product stability and lifespan. Nylon turf is the best on the market today, with a melting point of over 400 degrees. These products are well researched and tested to last longer than the average 10 year warranty. The winter doesn’t harm the grass, in fact the snow stops the UV rays from hitting the turf. There are short blade and medium blade lengths as well as both fine and thick turf. Some are designed for high traffic areas and some for traditional lawn appearances. A sweep with a broom and an occasional spray of water takes care of most SYNLawn cleaning and maintenance. For high traffic areas, cross brushing will restore the natural appearance if grass becomes matted. Lawns should also be monitored for spills and stains. Garden City Groundskeeping is equipped to maintain your SYNLawn as part of overall maintenance services and can answer any questions or concerns you have about synthetic turf maintenance or where to buy artificial grass. 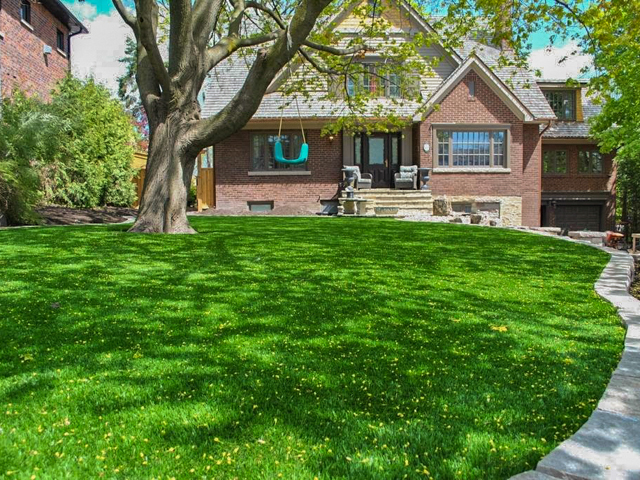 Give us a call today, or to learn more about the variety of SYNLawn products and what these products can do for you, visit the SYNLawn Toronto Web site. Get more tips from SYNLawn's official DIY page.